If you are like me, one of the things I always look up before I go to a new country is the rules of tipping or tipping etiquette. Being American, I come from a country where we tip for everything. If someone raises a hand to help you in any way, you are supposed to give them a few dollars for their help. Conversely when my family came to China for a visit, I practically had to beg them not to tip. China is a country where tips are not the norm. And in fact, tipping can serve to accentuate the class difference between the person who is receiving help vs. the person who is giving it, resulting to the helper feeling as if they are losing esteem or respect. The point is, remember you are always a guest in a country when you travel. Your home country rules of etiquette generally no longer apply. And tipping / or not tipping can be an embarrassing breach of etiquette if you don’t know what to do. 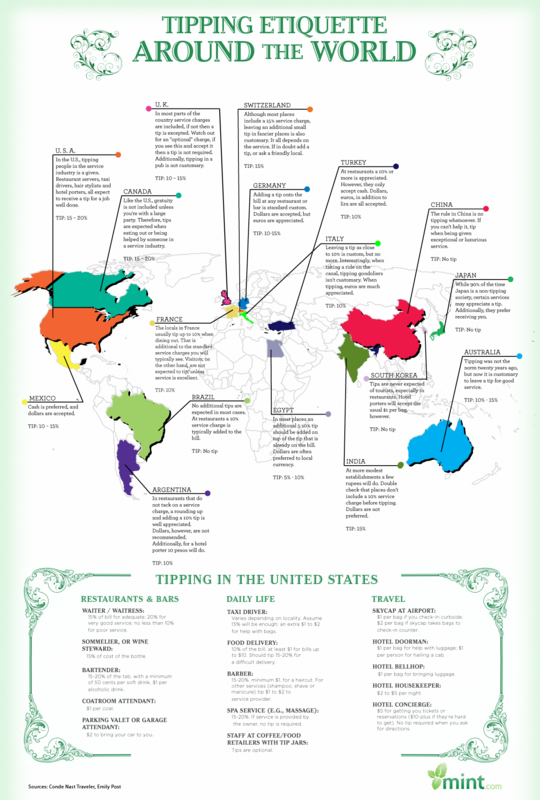 This is why I was thrilled to find the infographic below on tipping etiquette around the world, from Mint personal finance. Just load this up on your phone and you will never be faced with that jetlagged moment in the airport or in a taxi wondering if you should tip or not. You are right! My mistake. But since I used to live there, I can easily explain. In general, there is no tipping in Thailand, but there are a few exceptions for recognizing very good service. In a local restaurant you might leave the left over change if it is a few THB. T At 5-star hotels you might want to tip the bell boy a little for carrying your bags, but this is really optional and based on exceptional service – not more than 30-40THB. The only exception is at a fancy international restaurant, if a service charge is not included. For massage, you mitt tip 20-50THB if it is really exceptional service. Otherwise, no tipping needed in Thailand, e.g. taxis do not expect tips.